in yor strong broth thro a hair sive and lett it just simmer over a slow fire an hour yn cut some sweetbreads very thin put ym in and lett it simmer another hour Season it with nutmegg cloves mace & peper beat small & salt to yor taist. 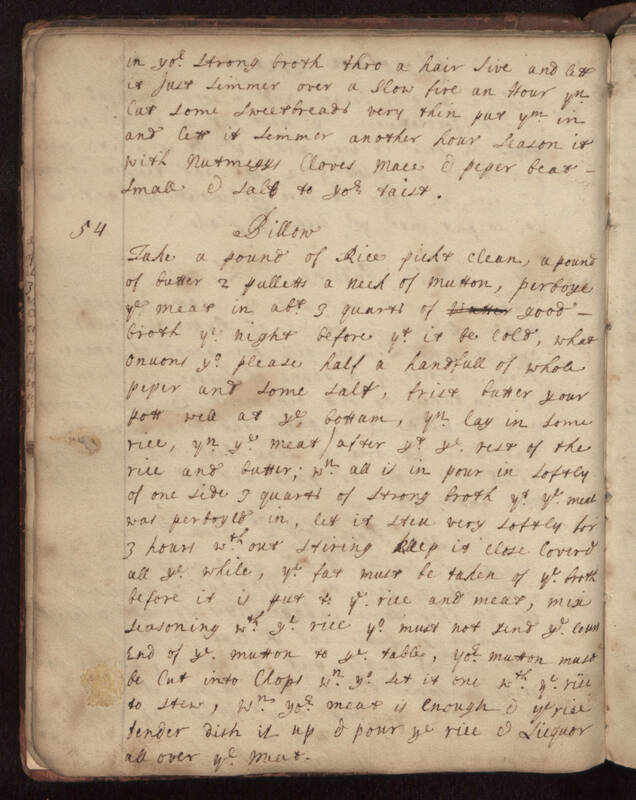 54 Billow Take a pound of rice pick & clean, a pound of butter 2 palletts a neck of mutton, parboyle ye meat in abt 3 quarts of good broth ye night before yt it be cold, what onuons yo please half a handfull of whole peper and some salt, frist butter your pott well at ye bottam, yn lay in some rice, yn ye meat/ after yt ye rest of the rice and butter; wn all is in pour in softly of one side 3 quarts of strong broth yt ye meat was perboyld in, let it stew very softly for 3 hours wthout stiring keep it close coverd all ye while, ye fat must be taken of ye broth before it is put to ye rice and meat, mix seasoning wth ye rice yo must not send ye [loun?] end of ye mutton to ye table, yor mutton must be cut into chops wn yo set it one wth ye rice to stew, wn yor meat is enough & ye rice tender dish it up & pour ye rice & liquor all over ye meat.